Seriously, I did turn fifty recently, and I can't really tell the different except for one very important issue. And by that I mean, that last year, somewhere along the line, I pulled something in my lower back. The Doc had assured me that I could work it out as long as I kept trying to strengthen my lower back. This morning I called the Dr's office and she's recommending Physical Therapy. The reason I'm posting here is that I've early last year I decided to get a Mindshift 36L backpack for my camera gear and work laptop. What was I thinking! I sometimes shoot during lunch so I always lug my camera gear with me. However, last fall I broke down and up the Mindshift 26L. Much lighter, but this baby is still heavy! I guess I don't have to lug my gear with me into the office, but its a hell of a walk back to the car if I want to get my gear for a fun hike at lunch. I saw the Mindshift Airport Navigator while looking at the wheeled camera bags, but I already have the Airport Roller by Thinktank. So I'm not sure I want to fork over another $300 on a luggage/travel bag. However, I think for at least the next few months, I need to give the lower back a break. So do I get a cheapy $30 grocery dolly and strap my backpack on it, separate my gear into a laptop bag and camera bag and leave the gear in the car ALWAYs, or just give the back a break and leave the gear safely at home? For those of you with back issues, what have you done? Have you checked out the think tank belt system, it’s supposed to take weight off your back. Yoga position called "The Cobra". The PT will probably teach it to you but not call it that. One of a few exercises I learned that helped me out a lot. At you age (I will be 68 next month) we decided to give the Sleep Number bed a try. Two thumbs up from both me and my wife. The bed is still going strong over 15 years later. I would not use a cheap grocery store dolly. The wheels are too small and lots of vibrations. Something like those three wheel strollers that you see runners using when pushing their babies along might work. Might find one cheap at a garage sale. Look at the Eckla, Rolly carts on the B&H website for an idea of what you may need. Find a therapeutic yoga class or private instructor. Make sure your doctor OK's it - but seriously this will help if your back issues can be improved via strengthening the muscles and improving flexibility. Most people will experience a huge improvement, but some issues are not going to go away. In the meantime - a smaller bag or lighter gear seem the answers. I have a friend who is mostly car bound these days. He moves away from the car a short bit but not far. My dad is similar. Dad uses a window mount and the car and m43 gear. My other friend is shooting Fuji these days. Ok, I'm even older than you. 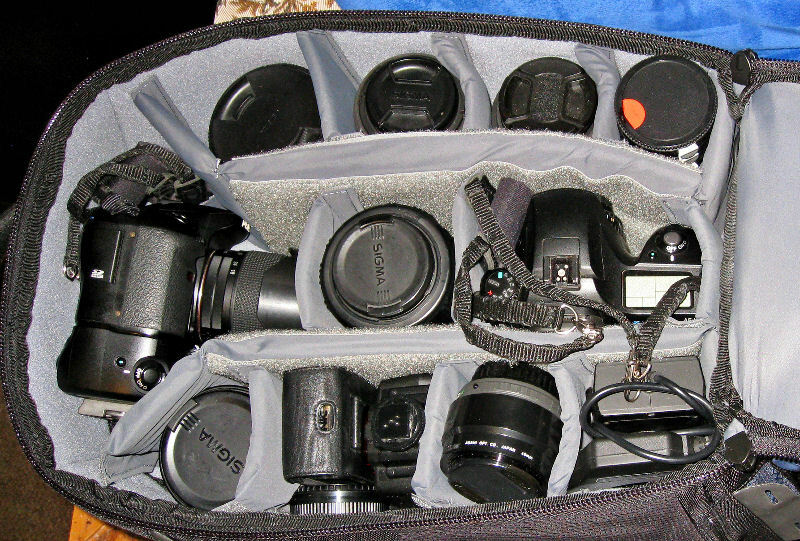 However, given that there are no perfect camera bags, you have to really look around. I must have a dozen bags of varying sizes from small to large and I actually just got a rolling one for international travel. I have Think Tank one which I felt fits me very nicely and enough gear to do serious work while traveling but last year using it in Ireland and the southwest crawling around in slot canyons produced a lot of sore mussels and some back pain. Ramseybuckeye's suggestion of the Think Tank belt system is a good one. I have one of those too. Basically, I have my camera on a BlackRapid strap with it and carry up to three lenses on my belt. Doesn't replace a pack but it's a lot easier in the field. Ultimately you have to get a balance between what you want to bring and what you can carry. Personally, while I've slacked off keeping a camera always near me, I will typically make up a different kit for each shoot, load them into a bag, put it on my back and determine if I can add a few more or take out somethings. While the new full frame gear is great it does tend to be heavier. Paying attention to your lens (and gear in general) choices can also help with weight. Really, I suggest going to your camera store and trying on a bunch of bags. Additionally, not knowing anything about your physical shape, it's possible that loosing weight/increasing your fitness may also be an avenue of exploration. Regardless, first get your back better. Best of luck, been there myself. Most has already been said about the camera bags, but instead of a different camera bag, what about an extra camera? GR III or a cheap GR II, might be perfect for those lunch breaks and you just put it in your pocket. I'm 52, and have already gone the PT route for the back. Besides core strengthening, walking helps. (If I would get away from the desk and walk more, I would probably have less back problems.) When my back acts up, I reduce the kit from my photo backpack to just a mini shoulder bag and my "light" kit: a K-S1 and a couple DA Ltd lenses. Good luck on the PT. Remember: never sass back at your Physical Therapist, and never tell them the exercises are getting easier - either way, they get creative. If you are considering a roller but don't want to spend all those $$$, here is an economical solution that proved perfect for me – as a retired schoolteacher I am always looking for lower priced alternatives. I used a basic roller suitcase that I already had (but any low priced one from Target, Walmart, etc. will do) and then went on-line to Amazon and looked under "padded camera insert." Armed with the inside dimensions of my suitcase, I selected several inserts that fit perfectly, giving plenty of protection and lots of flexibility. The whole thing works a treat and allows me to carry a complete kit when I travel. In fact it has become so handy, I now pretty much just throw it in the back of the SUV and then pick and choose what I want when I get to a destinaton. Between a multi-pocketed vest and a belt pack, my backpack does not get used much any more. Are there any geriatric Camera bag solutions out there? There are quite a few systems that incorporate wheels, which keeps the load off me. This is exactly where I was headed in my reply. I've got a nicely blown up back but always want to carry a camera. After messing around with a K-01 and an A6000, I landed on a Q-S1 to go for the ride everywhere. When I am more purposefully oriented, it's the K-1 or K3II in whatever configuration I need, but for that just in case, The Q-S1 with 06 and 02 zooms is a pretty sweet combo to always have at hand, and at the price of nice gear, you can pick them up for about the same amount, if you watch a bit for good prices. ...So do I get a cheapy $30 grocery dolly and strap my backpack on it, separate my gear into a laptop bag and camera bag and leave the gear in the car ALWAYs, or just give the back a break and leave the gear safely at home? As a mid-septuagenarian who spent four continuous months in a hospital ICU following heart bypass surgery, I no longer have the strength to lift a heavy camera backpack and strap it to my back. There are a couple of suggestions that I can make for you. One is to get a Remin collapsible luggage cart such as the KART-a-BAG Concorde II. This is a well made durable product that can easily roll up and down stairs if needed. It rolls fine on paved surfaces, compressed soil or grassy lawns but does roll easily on surfaces that are covered with large chunks of gravel. I've owned a Remin cart for more than twenty years and never regretted making the purchase. The other suggestion is to get a Tenba Professional Photo Vest. It has numerous pockets including a long lens pocket. The best feature of the Tenba Professional Photo Vest is its built-in waist belt that transfer the weight of the loaded vest from the wearer's shoulders to the hips. I travel to photo locations with a vast variety of gear in the trunk of my car and then transfer what I need to my photo vest upon arrival. Although no longer manufactured, the Tenba Professional Photo Vest is still available, both new and used, in a variety of sizes from Internet sellers. I carry my camera around my neck with a wide spongy neck strap and I use a padded shoulder strap to carry my tripod. Last edited by Kelvin 5500; 02-28-2019 at 09:13 PM. I never thought of myself as that at age 50, at age my age now 19 years later, maybe, but at age 50 no way. I used a backpack and still do. Neither of those backpacks should be putting weight on your back. It should be transferred to your hips via the waist belt, leaving the shoulder straps for simple stability. It's common for people not accustomed to backpacking to have their shoulder straps too tight and/or waist belt too loose. If you have a friend that does some overnight backpacking, they should be able to assess your pack fit and help with adjustments. Only bag I have - travel everywhere by public transport and feet.